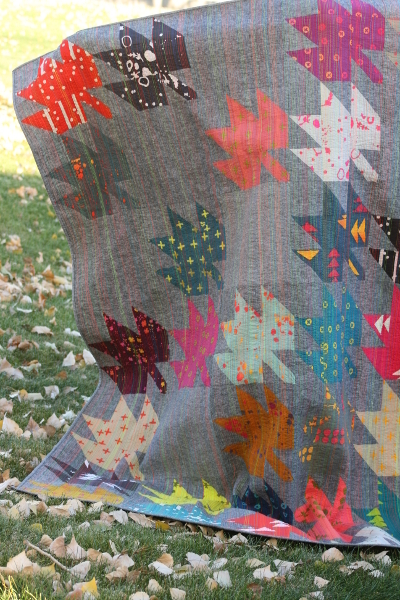 I finished my Modern Maples quilt in November and managed to snap a few photos before the sun went down and the weather changed. I can’t say enough about how beautiful the Alison Glass handcrafted fabrics are, but I must say I really like them with the matchstick quilting I did. Before I made the first test block, I knew I would quilt it this way. It’s a large quilt, 72″ x 84″, and I did all the quilting on my little machine. After many hours and 14 spools of thread in 14 different colors – including 6 neons – it’s done and I’m so, so glad I didn’t give up! The quilting adds a beautiful texture to the quilt, makes the yarn dyed linen background fabric even more interesting, and draws you in to get a closer look. For a few years now I’ve been a member of the Utah County Modern Quilt Group and it’s blessed my life in so many ways. One of the things I learned there was the importance of making a quilt interesting from several viewing distances. 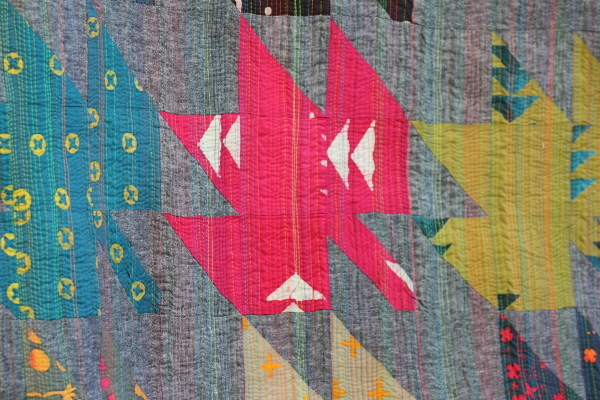 The block design and fabric are striking at a distance, but the quilting in so many colors makes it equally striking up close. I feel like I made a good decision with the quilting. I love the texture and drape of this quilt. 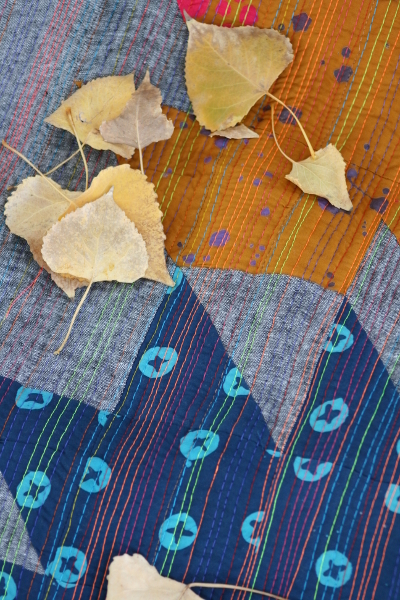 It’s a little heavy with the linen and all that thread – perfect for a fall quilt. This one will be loved for many years at our house. 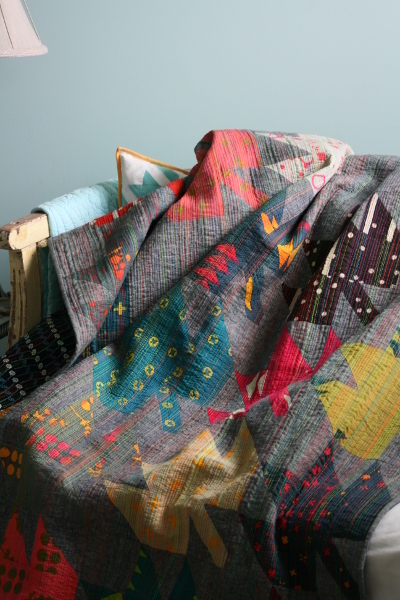 It’s also nice to have made an entire quilt from start to finish before 2015 ended. There hasn’t been much sewing around here for a long time. Completing this impulsive project was just the thing to unlock my creative juices. It is so beautiful, you are so talented! Beautiful, Jennifer. I have used your lone star tutorial several times and want you to know that it is extremely clear and well written. Thank you. WOW!!! loved the fabric and the use of different colors of threads. 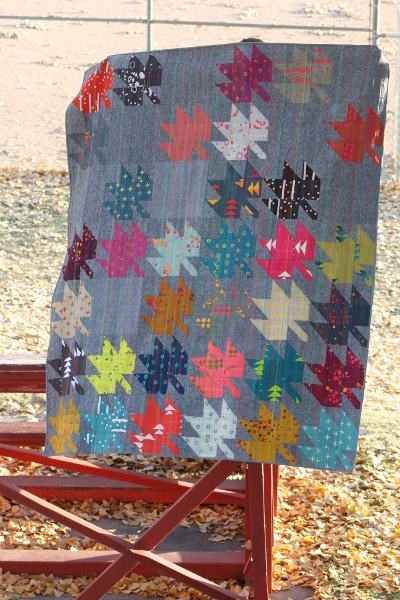 Maple leaf quilts are one of my favorites, thanks for sharing.